I don't see what this is about. I'm not sure how this qualifies as sports. The colours seem a bit washed out. It took me a while to figure out what's going on in this picture, the subjects are relatively small in the frame, especially considering there's nothing spectacular about the background. I think it would help if you were closer and perhaps shooting from a different angle, maybe from slightly behind one of the people. Also, midday lighting is hard to shoot in, you might try the same concept later in the day when the sun is less harsh. I can't actually see what they are doing... What is the subject of the image? A frisbee? 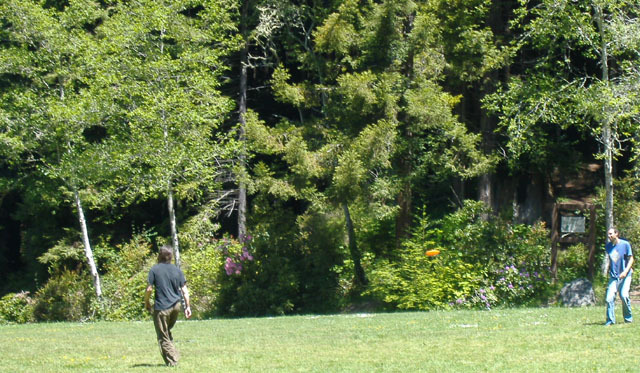 Took me awhile to find the frisbee in flight as it is lost to the trees in the background. This is not sharp, there are blown highlights, there is no composition to talk of and you can hardly see what the to persons are doing. Nice shot but you cannot see the players faces, in sports photography this is a must. Proudly hosted by Sargasso Networks. Current Server Time: 04/18/2019 04:25:18 PM EDT.